Maintaining consistent, perfect temperature in both the freezer and refrigerator is necessary to keep foods fresh for as long as possible. Twin Cooling Plus™ keeps refrigerator and freezer separate, keeping temperatures in both compartments more consistent. Twin Cooling Plus™ also keeps humidity at near-commercial grade levels to prevent perishable items from spoiling. Bright lighting makes everything your refrigerator stand out like it is on the shelves of a supermarket. Plus the LED lighting in this refrigerator is very energy efficient, saving you energy costs. Samsung's CoolSelect Pantry™ provides optimal temperature control for your food storage needs with Deli, Fresh and chilled options. No need to leave the defrosting out on the counter or loose in the fridge as the CoolSelect Pantry™ is great for safely defrosting items within a controlled space. The freezer drawer automatically slides out when opened making it easier for you to access commonly used frozen foods. Now you can wash laundry while helping the environment. Feel harmonious about this eco-friendly and energy-efficient Samsung washer which meets the Government 2015 ENERGY STAR®requirements . An added bonus is with less energy being used means your electricity bill will be lower, saving you money! With enough room to fit up to 25 bags of groceries there is no shortage of storage space in this refrigerator. The French Door Refrigerators 36" Wide, 25 Cu.Ft. 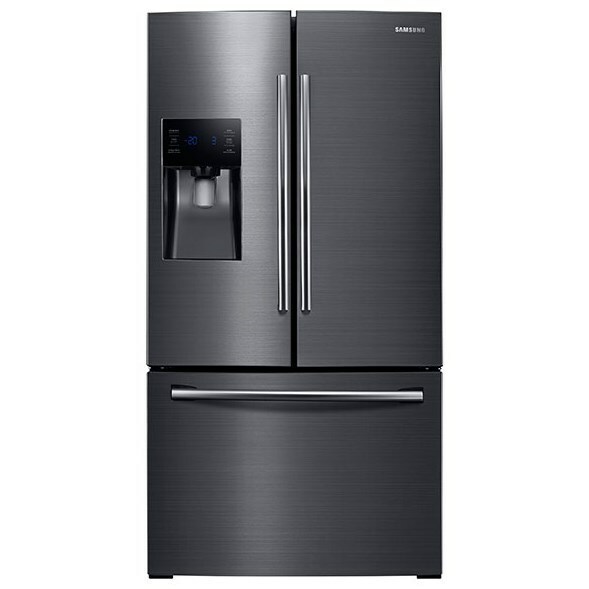 French Door with External Water & Ice Dispenser by Samsung Appliances at Furniture Fair - North Carolina in the Jacksonville, Greenville, Goldsboro, New Bern, Rocky Mount, Wilmington NC area. Product availability may vary. Contact us for the most current availability on this product. Capacity: Refrigerator 16.6 Cu. Ft.
Capacity: Freezer 8 Cu. Ft.
Capacity: Total 24.6 Cu. Ft.